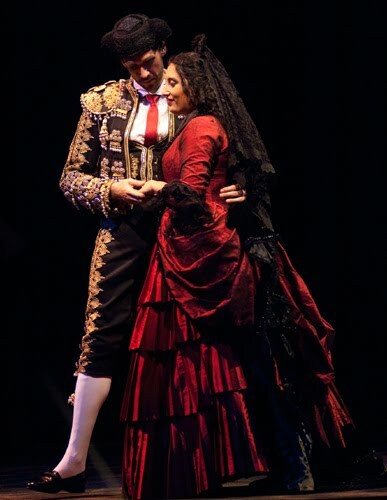 As Costume Design Coordinator for Carmen, Heidi Zamora re-designed several costumes for Seattle Opera’s leading ladies, in addition to weighing in on details of virtually every costume in the show. We spoke about her design process, a theater piece called Robopop that she co-directed with her husband, and got a sneak peek at her costume design ideas for Orphée et Eurydice. As the Costume Design Coordinator, you are sometimes called upon to create new costumes for a show, even if the majority of the costumes have been rented or are coming from another designer. How many new costumes did you design for Carmen? We designed three new Carmen costumes for Carmen and one new one for Micaëla. And the cigarette women have a new look this time around. Those are the main differences that people will notice. 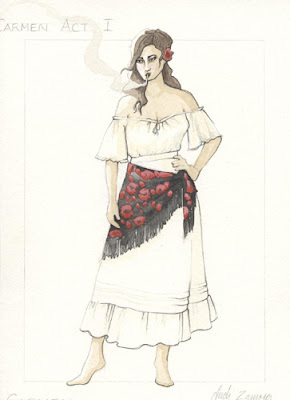 Tell us about the costume sketch (above) that’s in the Carmen program. Did you design that particular costume? When will Carmen wear it? That’s Carmen’s first entrance in Act I. She’s wearing the white skirt and petticoat with her Spanish shawl around her waist. That’s what all the chorus cigarette girls wear, a really pale or white look with peasant blouses that are showing some shoulders. When designing a costume for someone, where do you start? With the character, singer, or the director’s ideas for the production? When you’re design coordinating, you hit the ground running. You’re not starting at the same point that you would if you were creating a show from the ground up. So you start at all of the places you mentioned: what does the singer look like, what are the characters’ needs, what does the director want, and then what does the existing show look like? The new costumes need to fit within the world of the production. You can’t do a totally different concept. It has to be the period. It has to work within the color palette and the overall feeling. The director this time around wanted a more sexed-up look for Carmen, so that’s where I started. Then you look at the singers you have to work with—both of which are great looking, so that made it a lot easier—and try to work within the color palette you have. What other costumes did you sketch/create? And then what was your role with these particular costumes after that? In a sense I’ve worked on them all. When the original designer isn’t here to work on the show, we still have to do fittings for dozens of people. I’m the person in the fitting room saying, “I’m not sure if that sash works; here let’s try this sash,” or “I think the sleeve hem needs to be a half an inch longer,” and “That hat doesn’t fit, so let’s give him a head scarf.” There are a million of those little choices to be made along the way even when a show has already been designed once before, and that’s a huge amount of work. In this production there are the principals that we’ve redesigned—the principal women particularly—and then we have dancers in this production that we didn’t have last time around. I had to create gypsy costumes for the male dancers and then we also gave them existing soldier costumes and matador costumes. The female dancers are cigarette girls and gypsies. We also have a Carmen double, so we needed a duplicate of Carmen’s Act IV dress that we made new for this production. 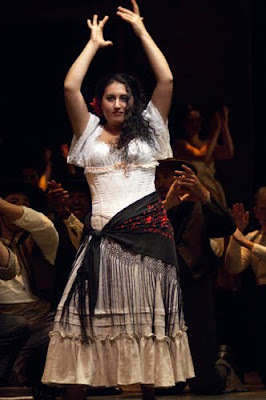 How influential is tradition in terms of creating a Carmen costume? People have an expectation of what Carmen looks like, and while you can’t please everybody, I obviously need to please the director and Speight and the singer. So you try to find a marriage that pleases those three people and myself as the person with the design point of view in the room. Often I’ll bring sketches to Speight to say, “Is this ok?” And he’ll say, “Yes, she’s wearing red.” There are some expectations in opera that Carmen wears red or Tosca always wears red in Act II or so and so always wears white. Speight might be less apt to break those expectations than I might be...which sometimes makes for an interesting conversation. Do you have a background in opera? You’ve probably had to learn all these expectations. My background is in theater. I didn’t do a lot of opera until I started working here. I had to learn, for instance, that Micaëla is always blond. Speight is a great resource for this kind of thing. You can always make a choice not to do it the way it’s always been done, but you just have to know that’s what you’re doing. When was the last time you worked on a theater project? It was a ridiculous idea to begin with, but the production value was really high and the actors were really good. It was an experimental theater piece that wasn’t designed to be “Hmmm…that was thought provoking.” Everything was very clear and it was supposed to be fun. It made people happy. In a sense it was a musical because there was music from the beginning to the end, a lot of pop and techno music, sort of “robot music,” so it was kind of like going to a concert or going to a music video in the theater. How did you first become interested in costume design? I had always sewn as a kid. In college I started hanging out with kids in the theater department who knew that I could sew, and they said, “You should be a costume designer.” Your high school guidance counselor doesn’t offer that up as an option, so it didn’t occur to me that that was a job. So I started working in the costume shop in college and took acting and directing classes in theater and fell into it. How long have you been working with Seattle Opera? In my current position I’ve been here since 2007. Are there any other costumes in Carmen that you want to say anything about? 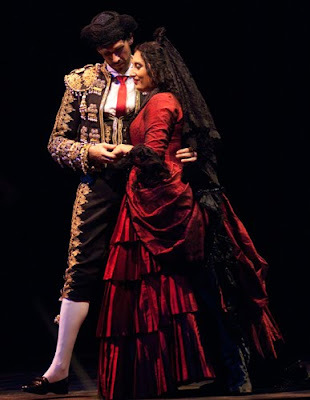 I think that one of the most interesting costumes is Escamillo’s Act IV costume, which is his Toreader suit of lights. 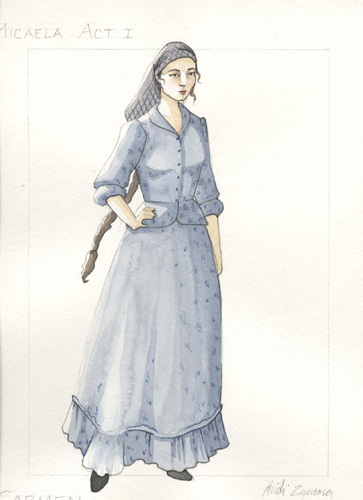 That was an existing costume from the last production, which we just refreshed a bit. There are many, many, many hours of handwork and beading in that costume, and it’s quite beautiful and striking. The original designer and our costume shop did a lot of research into what matadors traditionally wear. I really love that costume. It’s also so different to be able to dress one of the leading men as a peacock. It’s usually the sopranos who get to get all fancied up, so it’s fun to have a man’s costume that’s beautiful and encrusted in lace and bead and trim. Is this the first time you’ve worked in the role of Costume Design Coordinator? I’m usually in that role once or twice a season. I was costume design coordinator for The Barber of Seville and Don Quichotte last season. You will be the lead costume designer for Orphée et Eurydice. Can you let us in on any of your plans? It’s going to be very cool because Orphée is this wide open world. You can do whatever you want. It’s not as traditional an opera as Carmen or Madama Butterfly, and a large portion of it is a fantasy. It’s been fun to start from the beginning with the director and other designers, and to say, “If we can do anything, what would that be?” It’s going to have echoes of the Greek world, so it’ll have a neoclassical feel with modern elements. It will feel very accessible and very real but still timeless in a sense. In that show you will be costume designer, Phillip Lienau will be the set designer, and Connie Yun will be the lighting designer. All of you work for Seattle Opera, so it’ll be very “in house” production. Does that open up new possibilities for your collaboration? Definitely. The fact that we’re all here means we’ve been able to get together and share images and compare sketches more often than in a typical opera design process. The director lives in San Francisco, so he isn’t always here, but we’ve gotten together for a couple of meetings, just to update each other on our separate process. I think it’s going to be very cohesive for this reason. A lot of time the set gets designed in New York and the costumes get designed in Seattle and the lighting is designed later, but Connie has been able to be a part of the process from the beginning, which I think will really enhance her work. And in terms of collaborating on color, the set designer is choosing the color of the floor partly based on the costume color for the Furies, so that’s been interesting to work closely in that way. Do you ever make your own clothes? I used to when I was in college and then I went to grad school and got too busy. When I was just starting out I was a stitcher in shops and the last thing you want to do when you get home is sew some more. But now that I have a son, I like to sew for him when I have the time. I made a quilt for him and I have all these projects in mind, little stuffed elephants, though I don’t know if I’ll ever get to them. But I wouldn’t make clothes for him because he’s growing so fast. That’s the thing that’s great about seeing the work done in the shop. So much time is put into these costumes. You would never do that in a clothing piece that you made for yourself. If I sewed, I’d want to do it right, but it’s time consuming and expensive to get nice fabric, which is why designer couture clothes cost so much money. It’s not cost effective. Will you make your son’s Halloween costume? That will be the one exception. We’ll have to do that every year. I’m sure other costume designers hate Halloween! But I have some Orphée costumes sketches due soon, and I can’t deal with Halloween until after that, so I’m going to have to turn it around pretty quickly! What do you enjoy most about working in a costume shop? Thanks for sharing the post. Costume designing is an interesting job. It requires a lot of creativity.Nowadays it has gained a lot of popularity. We need to put in a lot of hard work. She has done a great job. I am glad that I have visited this site. The posts shared here are really interesting. Keep on sharing new posts.